Welcome to Faust Real Estate, L.L.C. This is the only real estate site you need to visit! DON'T MISS OUR FEATURED PROPERTY! 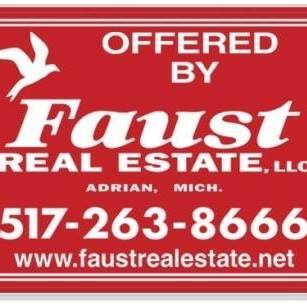 Faust Real Estate was founded in 1982 by Larry Faust, Owner/Broker. Larry along with his sales agents and office staff are committed to outstanding Customer Service. We work with all Real Estate companies throughout Michigan, so whatever you want to buy or sell we can help you. Whether you want to buy or sell vacant land, a home, farm, lake property, a business or commercial property, we are ready to go to work for you! You can view our listings by clicking on the appropriate buttons at the left. We also have our properties listed on Trulia.com, Zillow.com, Realtor.com, Loopnet.com, Easy Home Search and LandHub, as do many other companies in Michigan. To view properties on EasyHomeSearch.com click here. View our properties on LandHub here: Faust Listings. We can help you with ANY property listed on ANY web site - no matter who has it listed. Thank you for visiting our site where you can browse our listings, view a list of our agents, or find out how to contact us. Please contact us to find out more about listing your property with Faust Real Estate, L.L.C! Tell us what you are looking for & we will help you find it! All content Copyright © 1999-2019 Faust Real Estate, LLC. All Rights Reserved.